Civilians, i.e., non-gardeners, labor under the illusion that this season is called winter, but we soldiers of the soil know that it is actually Seed Catalog season. This is just part of my haul for the last two weeks. Every day our postwoman brings me a new batch. Like most gardeners, I love getting seed catalogs, although, truth to tell, except for my vegetable garden, I don't plant that many seeds. I prefer to get my plants already started from the nursery. This season I am breaking my tradition just a bit. I've set my grow-light system up in the garage and, this week, I planted a few 'Brandywine' tomato seeds and stuck them under the lights. 'Brandywine' is a delicious heirloom variety that doesn't really stand up well to our heat, but I figure if I can get them started and into the ground early enough, and then protect them if it does turn cold, I might get a decent crop before the intense heat of early summer hits us. Considering that my tomato crops for the last couple of years haven't been anything to brag about, it seems worth the risk and trouble. This week I also finished up one of the new planting beds I've been working on in the backyard and got the backbone plants of the bed moved in. Now I just have to finish putting in the filler plants and - voila`! - one more bed complete. 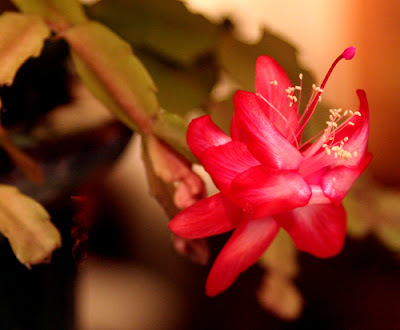 During the Christmas holidays, my Christmas cactus did actually manage to produce a few blooms. Its first bloom fully opened on Christmas Day and since then a few more of these luscious blossoms have joined it. The plant still has some more buds but it will never be full of blooms as it was last year at this time. I think I failed to give it sufficient darkness this fall for the buds to develop. I must try to remember to do better in 2011. 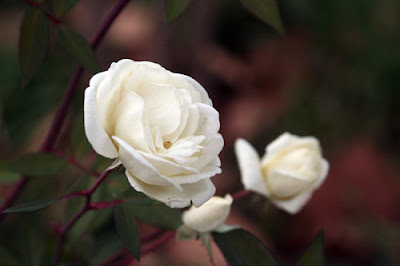 Outside, the blooms are very sparse as the old year fades into memory. The gerberas are still blooming. 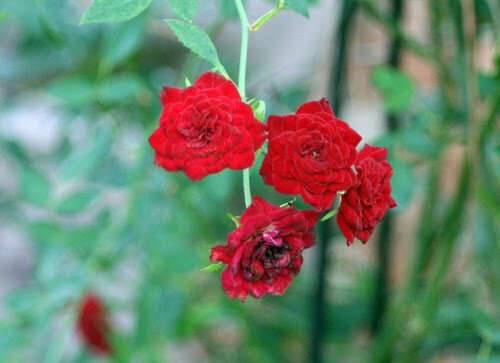 Even though most of the roses, even the 'Knockouts', are in a well-deserved rest period just now, little 'Red Cascade' just keeps on going. The plant has been covered with these tiny quarter-sized blossoms all autumn and it will greet 2011 still wearing its finery. 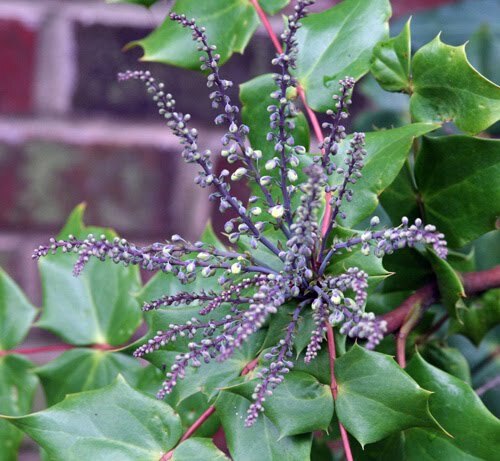 On the other hand, just beginning its bloom is the leatherleaf mahonia. This is my first winter with the plant and I find it fascinating. I look forward to seeing these buds open all the way. This morning I was looking out my kitchen window and saw something orange on the wooden fence there. Later, I went to investigate and found something unexpected. The coral honeysuckle that is planted on the other side of the fence had snaked one of its tendrils through a crack in the fence and that tendril had a bloom on it. A bit out of season, but very welcome, it made me smile to see it. "Never mind that the world is brown and gray now," the little blossom whispered to me as I bent to look at it. "Hold on. Spring is coming!" 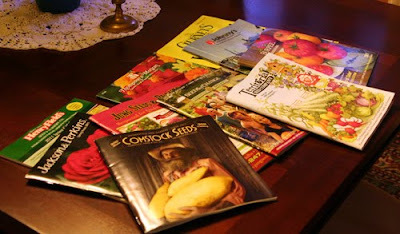 Yes, spring will be here before we know it, so let's enjoy these last few weeks of winter - I mean, Seed Catalog season. 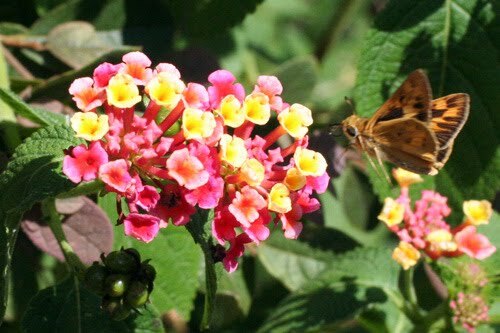 There's still time to dream of a perfect garden in 2011 before the reality of weeds, heat, drought and hungry insects wakes us from that dream. 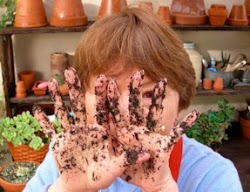 Happy New Year and happy gardening. Faux grass: The lawn of the future? 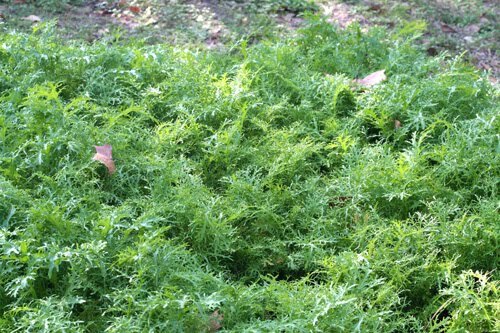 Have you heard about the latest thing in turf grass for those who demand an expanse of green in front of their house? It might (or might not) surprise you to learn that some gardeners are taking a page from the history of the Astrodome. Yes, they are "planting" their yards with Astroturf! This latest innovation in the perfect lawn seems to have taken hold especially on the West Coast and in some of the desert Southwest areas where water to lavish on real grass is scarce. The faux grass is finding its way not just onto homeowners' yards but into public play spaces as well, especially in the San Francisco area. This has caused some concern about possible health hazards to children playing on these artificial fields, but a recent study by the State of California found that the only hazard was an increased risk of skin abrasions when individuals fall on the stuff. That, it seems to me, is not an insignificant hazard, but, apparently at least, the "grass", which is actually made from old tires, does not present a toxic hazard. Call me an old fogey but I just can't see myself jumping on the faux grass bandwagon. 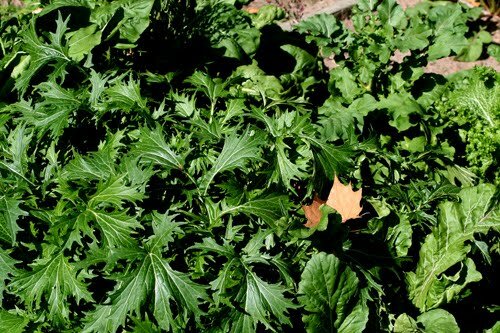 I speak as a gardener who presently has much of her front yard in bare ground because of the heavy shade from and the water-guzzling habits of the trees there. While it might be nice to have a wide expanse of flawless green stretching away in front of my house, I don't think artificial grass would be a good thing for the tiny critters who live in the soil, nor for the other critters, such as various skipper butterflies, who depend on real grass for their life cycle. It probably wouldn't be too good either for clumsy-footed gardeners who are sometimes prone to stumble and fall. I get abrasions enough in the normal course of my gardening activities. I don't think I need another abrasive hazard in my life. So I'll continue my search for the perfect groundcover that will survive and thrive in deep shade, and, meantime, I'll tolerate my dirt yard. At least when I fall, there'll be something soft and welcoming there to catch me. 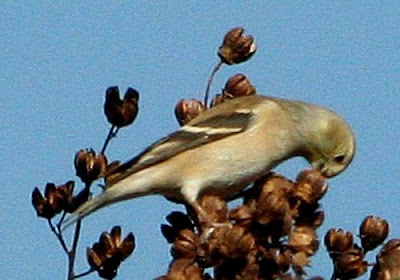 Wordless Wednesday: Goldfinches love crape myrtle seeds! JANUARY: A view of the backyard after the big January freeze had finally stripped all the leaves away. 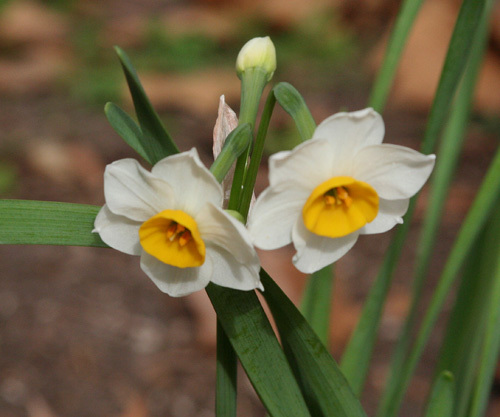 FEBRUARY: Daffodils gave a promise of spring. 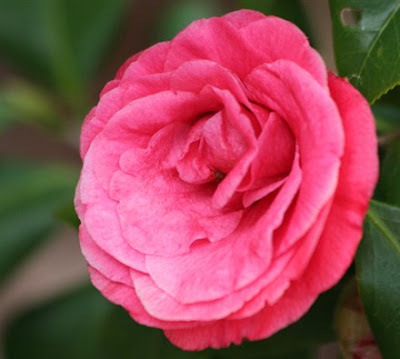 MARCH: My anonymous camellia was still in bloom. 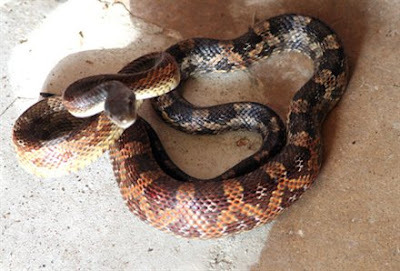 APRIL: A friend of the garden, the Texas rat snake, put in an appearance on my back porch. 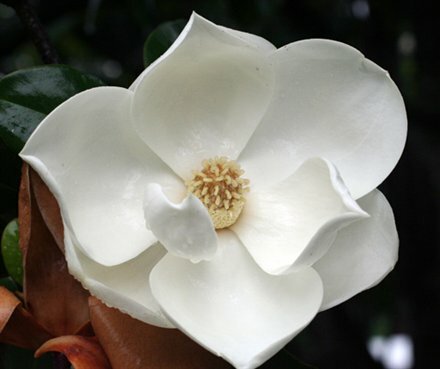 MAY: The month when magnolias earn their keep with their beautiful blossoms. 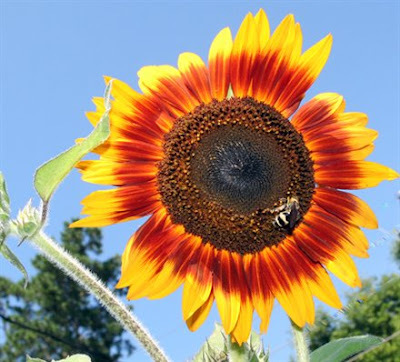 JUNE: The month of the sunflowers. JULY: An explosion in the population of insects means the gardener needs allies in controlling them. 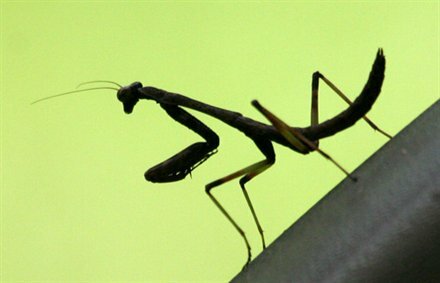 The praying mantis is one of the best. 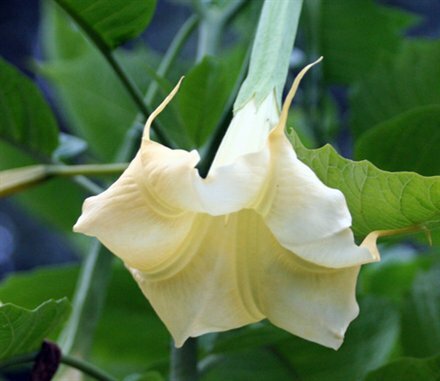 AUGUST: The brugmansias were finally in bloom. 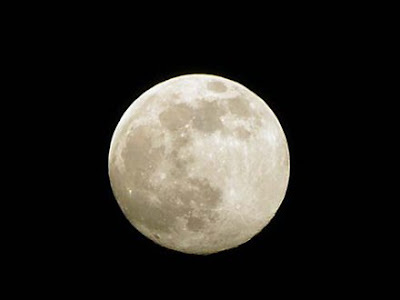 SEPTEMBER: The beautiful highlight of the month - literally - was the full Harvest Moon shining over my garden. 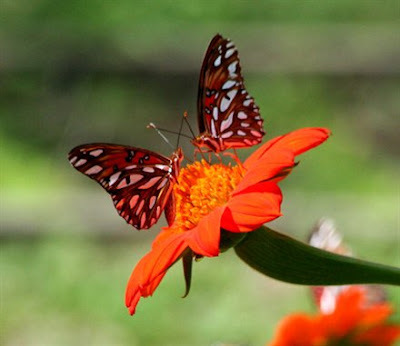 OCTOBER: Mexican sunflowers and Gulf Fritillary butterflies adorned the garden. NOVEMBER: Finally, Monarch butterflies were visiting the garden again and one left behind this calling card - her egg with a tiny embryo just visible inside. DECEMBER: In late November, we added a small pond to the backyard and in early December, I brought in some tiny goldfish, three of whom posed for this picture. It's been quite a year in my garden. I wonder what I'll have to show you this time next year? The garden took another hit last night as the temperature went below freezing again. This morning the birdbaths and even my little backyard fountain were covered in ice. The fountain, though, was very thinly covered and the water was still running. 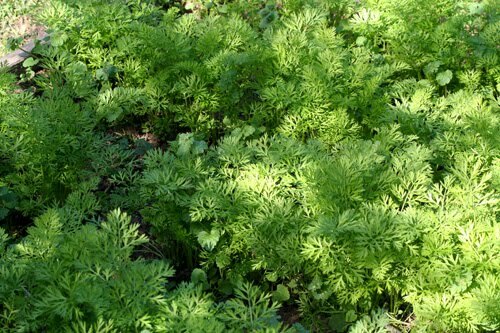 Our Christmas guests wanted to see my garden, but, unfortunately, I didn't have much to show them that wasn't brown and crispy. I told them they must come back in the summer when things are green and blooming. For now the main points of interest in the yard are the new pond, where the plants and fish seem to be thriving, and the new bottletree which continues to bloom in spite of the frost! 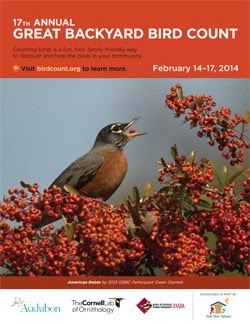 Oh, yes, and there are the birds, of course. The birdfeeders that have been pretty quiet all autumn have begun to pick up a bit more traffic now that it is winter. The goldfinches are finally visiting the feeders along with the warblers and that makes a difference. 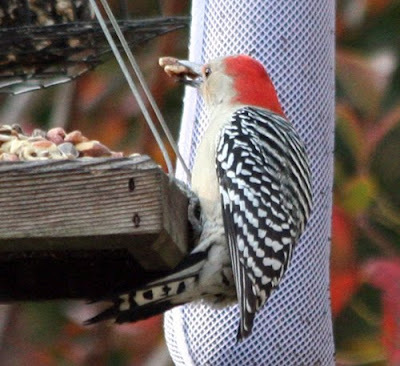 But some of my favorite feeder visitors are those who visit all year long, not just in the winter, and among the most faithful of these are the Red-bellied Woodpeckers. Mr. R.B. Woodpecker loves the peanuts on the feeding table and always goes for them first. Mrs. R.B., on the opposite side of the table, has more eclectic tastes and will sample a mouthful of whatever is before her. 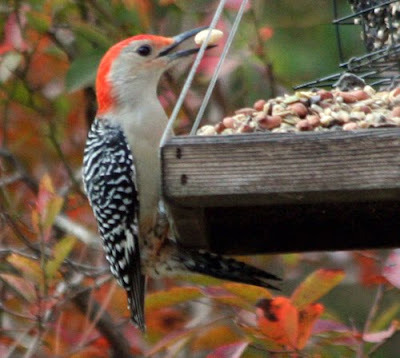 Woodpeckers are some of the most fun - and easiest - birds to watch in winter. They brighten the gardener's gray and brown landscape with their antics and outsized personalities, and Mr. and Mrs. Red-bellied Woodpecker are just about number one on my list of favorite winter visitors. I may not have blossoms, but as long as the birds are hungry, I will have some color in my yard and something to entertain me on winter days. 'Tis the season to be jolly. And busy. Very, very busy. It is likely that my time for blogging will be very scant from now until the end of the year, but before I abandon you, I thought I would leave you with a few images from my garden today. 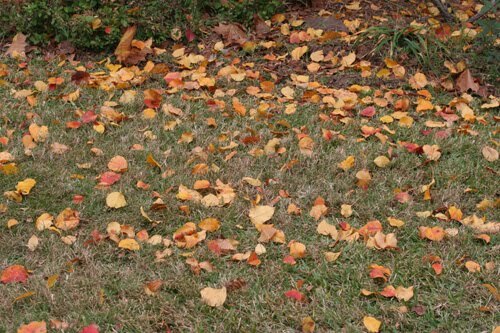 My lawn service was here yesterday and chopped up all the leaves that were on the ground - about a ton, I estimate - but already today the yard was scattered with a patchwork of more colorful leaves. Earlier this week, I had to drive over to The Woodlands and I was delighted to see the colors of the trees as I traveled the back roads to my destination. We don't often get a good season of fall colors here along the humid southern coast, but this year the weather seems to have hit us just right and the colors are truly vibrant. 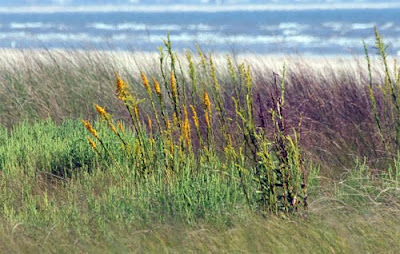 Maybe we have to wait a little longer than other parts of the country to get our colors but they are worth waiting for. 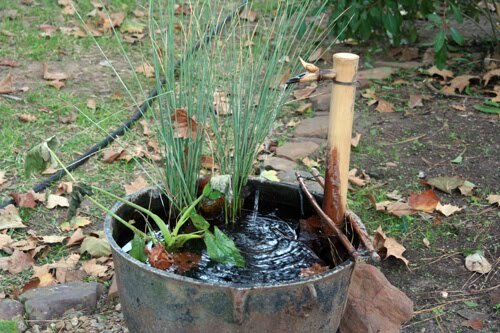 The drought still holds and I'm still watering my plants, though less often than in the blistering summer heat. I was out doing that chore today and I glanced over to a bed in the southwestern corner of the house's "L" and saw this. 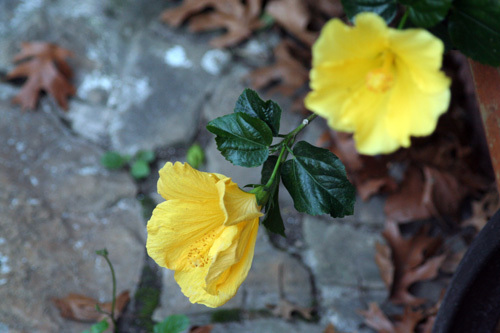 Esperanza, blooming in mid-December! My other Esperanza that is out in the open and unprotected was fried by the frost, but this one, although the tips of several branches were frost-bitten, still has green parts and some of those parts sport blooms. Nearby the Esperanza, this blue salvia also continues to be covered in its pretty little blooms. Another late bloomer. 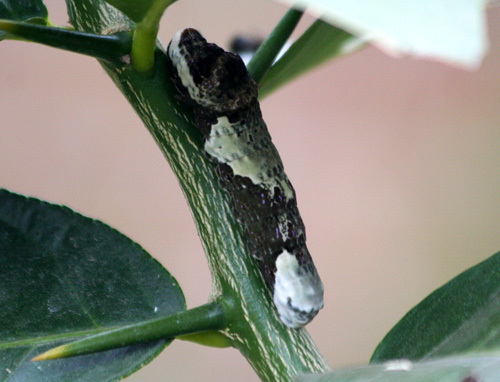 A few weeks ago my lemon tree was host to at least fifteen of these Giant Swallowtail caterpillars. 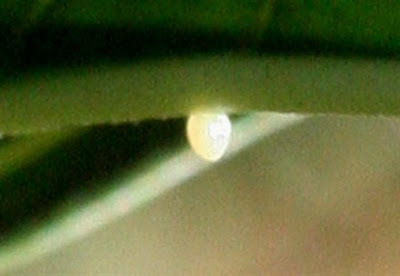 One by one, they reached pupation stage and went away to do their metamorphosing. I thought they were all gone, but late last week I found this fellow. He's just about doubled in size since I first saw him and he's almost ready to do his own disappearing and reappearing act. There's another "late bloomer" that I can't show you because I didn't have a camera in hand, but when I took my hose down off its hanger today, there was a tiny green tree frog under it! I guess a black rubber hose probably retains heat as well as anything in the yard, so that little frog was pretty smart. He probably thought he was tucked in for the winter. Poor baby! Well, I finished my watering and returned his blanket to its place so I hope he's comfy again tonight. If I don't see you here again for awhile, let me wish you a joyous holiday season with people whom you love and a happy and healthy 2011. Thanks for reading this year. 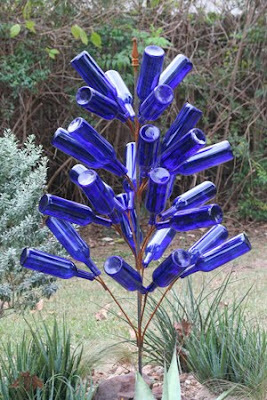 Only one week until Winter Solstice but what passes for winter here in Southeast Texas has already sneaked into my garden. 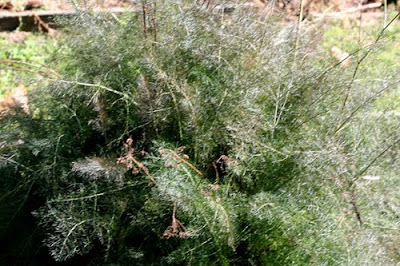 We've had several frosts, although no hard freezes yet, but everything that goes to sleep in response to cold weather is now sleeping and my garden has that brown and skeletal look of mid-winter. Some plants press on, of course. Many of the same bloomers that I showed you in late November continue to send out blossoms. 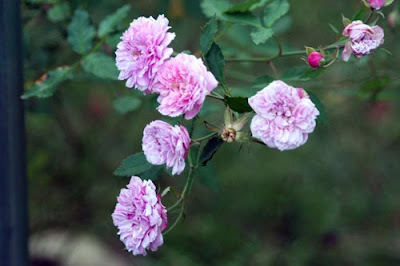 The tough old roses will not be deterred by anything less than temperatures in the 20s, so if I need color this December, I have only to visit with them. 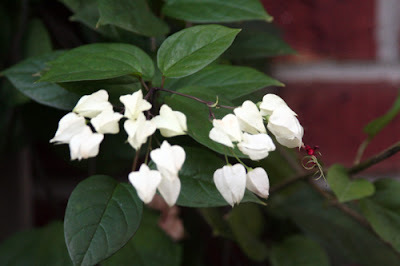 The Turk's caps have some limbs that found their way to the brick wall behind the bed where they live and those protected limbs are still full of blooms and are still visited daily by grateful butterflies. 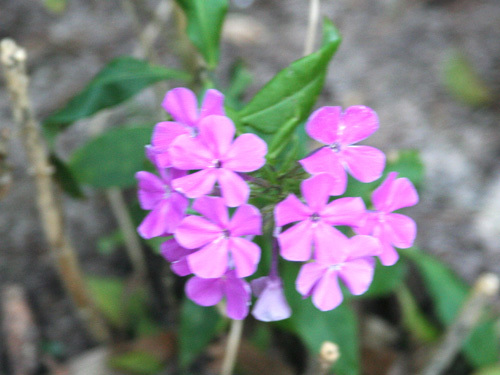 Likewise, the autumn sages, sprawling purple lantana, and blue plumbago continue to send out blooms. The gerberas, too, are still opening their inviting colorful disks to the butterflies each day. But these are the exceptions. Most of the garden is tucked in for a long winter nap. 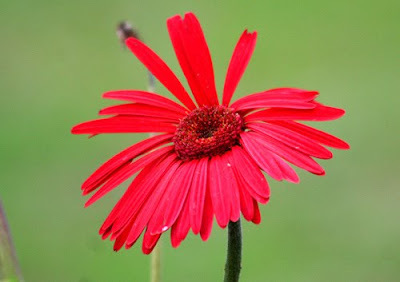 And so I was surprised a couple of days ago, as I fished the falling leaves out of my little pond, to glance over my right shoulder and see...a tiny bloom from plants that I had forgotten were even there. Sweet little narcissus! Your proper name has been tucked away somewhere among the wrinkles of my brain, but I greeted you on that cold, windy day like a long, lost friend - which is what you are, really. How it made me smile to see you! And it makes me smile again every day as I walk by you on the way to the pond and see your cheery blossoms. 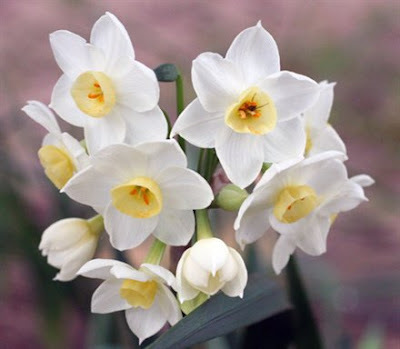 Sweet little narcissus - Nature's promise that spring will come again. Thank you for visiting with me today and a joyous holiday season and happy New Year to you all. With one thing and another, it has been a pretty busy week but not a very productive one in the garden. My list of fall cleanup chores continues to grow, but I made absolutely no headway on it this week. Instead, my week was spent going to appointments, running errands of various kinds, and trying to figure out when I would have time to put up a tree and holiday decorations. No matter how much I tell myself every year that I won't let it happen again, it always does. These last few weeks of the fifty-two, I'm caught up in a whirlwind of activity as I try to get ready for holiday guests and try to get everything done that needs to be done by the end of the year. And suddenly, the garden, which is my consuming passion for much of the year, plays a distinct second fiddle. I have new beds that need to be dug, plants that need to be planted, plants that need to be moved, plants that need to be cut back after the few frosts we've had, and none of it is getting done. It's frustrating, but there are only so many hours in the day and I only have so much energy, not a winning combination. I did note that my Christmas cactus is developing some fat buds. Perhaps they will actually open in time to greet their eponymic holiday. Likewise, the amaryllis bulbs that I potted up (belatedly) are growing. I must say I'm not hopeful about their ability to produce blooms before the end of the year though. I haven't even been able to spend any significant time observing the birds in my garden, although there still doesn't seem to be much activity at the feeders. Time to get my thistle feeders out. Another of the growing list of chores I need to accomplish this weekend. Speaking of birds, I dreamed of hummingbirds one night this week. I often dream of birds of all kinds actually, but the ones that visit my dreams most often are hummers. (No doubt there are Freudian implications, but I don't think I want to know about them!) The next day, I was sitting at my computer and idly gazing out the window at the hummingbird feeder that still hangs there when a visitor came calling. I think you'll agree this is a very odd hummingbird! Actually, I've seen many kinds of critters making use of my hummingbird feeders this year and it's nice to see that they are still serving some purpose, even though I haven't seen a hummer since about a week before Thanksgiving. I think much of the traffic at the feeders, especially of critters such as anoles, is attributable to our drought. We've had only neglible rain here since July, and, as La Nina is expected to continue to hold sway through at least May of next year, there seems to be little relief in sight. Meantime, I continue to water plants and critters and hope for the respite of a front that brings significant moisture. Santa, if you're reading this, all I really want is some rain. In the vegetable garden these days, it's all about the greens. 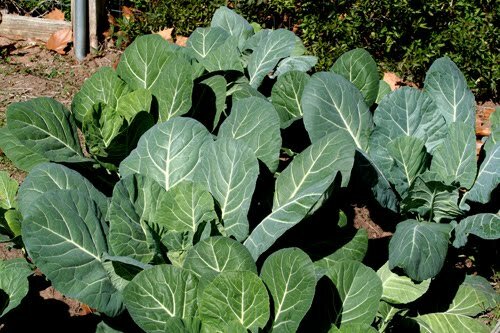 There are collards, of course. They took a while to get growing, but once they got started, wow! 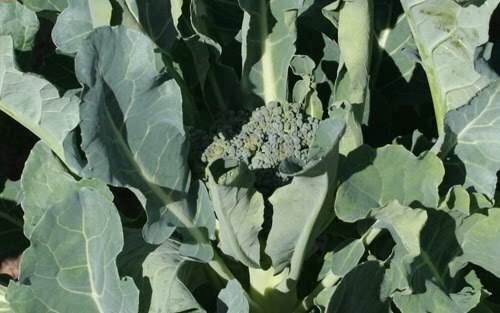 The broccoli is beginning to sprout some heads. The white turnips are growing like there's no tomorrow. 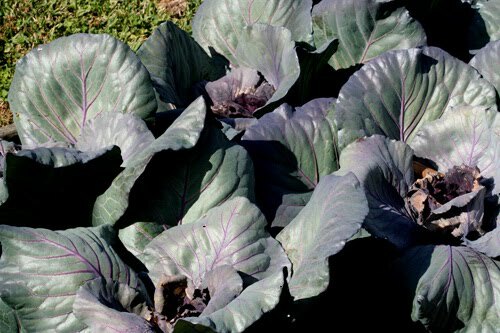 Some of the red cabbages' leaves got bitten by the frost, but it has hardly slowed them down. 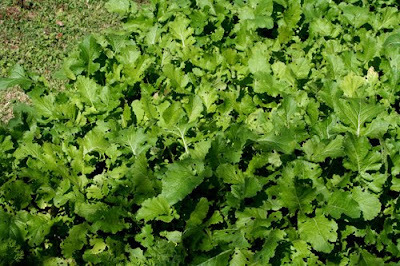 The mesclun mix has gotten almost knee-high in spots. And the delicate, ferny leaves of the mizuna mustard are almost too pretty to pick. Bronze fennel is holding up well, untouched by the frost. Well, you get the idea. I won't even bother to show you my spinach, Swiss chard and beets. All in all, even though my saved potatoes never germinated, except for one plant, and only a few of my sugar snap peas came up, we should have quite a lot of good eating ahead of us this winter. 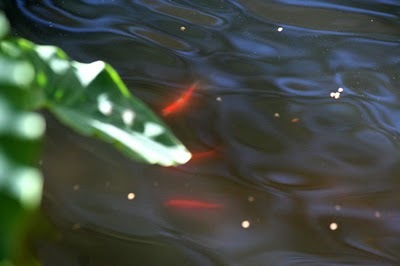 Having finished my documentation of the greens, I stopped by my new pond on the way back to the house to visit with my fish. All six of my tiny goldfish, as well as my giant plecostamus, are doing well and seem happy - as best I can judge the happiness of a fish - in their new home. Here are three of the goldfish. There are three of the orange variety, two white ones and one calico, and no, I haven't named them. They'll have to reveal their personalities to me before I can give them names. Farther along the path back to the house, I encountered this guest sunning herself. 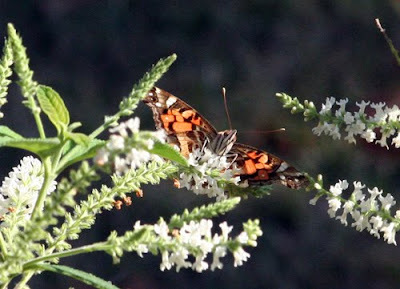 This is an American Painted Lady (Vanessa virginiensis) butterfly. 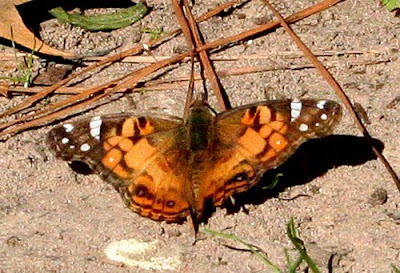 She is smaller and the dots on her wings are slightly different from the plain old Painted Lady (Vanessa cardui). This is a Painted Lady that I snapped on my new almond verbena a couple of days ago. 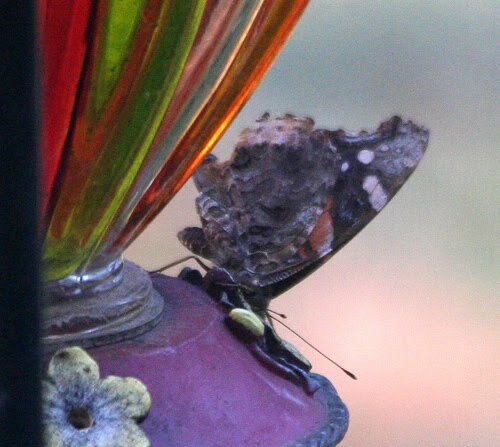 She was most uncooperative and I couldn't get a dorsal view, so you can't really tell much about her from this shot, but perhaps you can get a sense that she is quite a bit bigger than the little American Painted Lady. 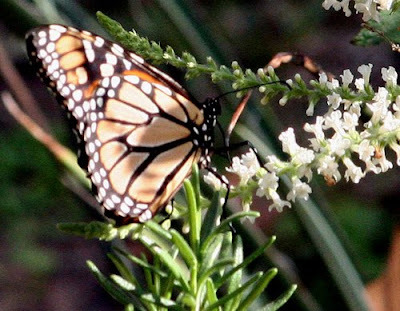 And speaking of that almond verbena, it is an absolute magnet for butterflies, including the few Monarchs that are gracing my yard these days. I'm so glad I got it! 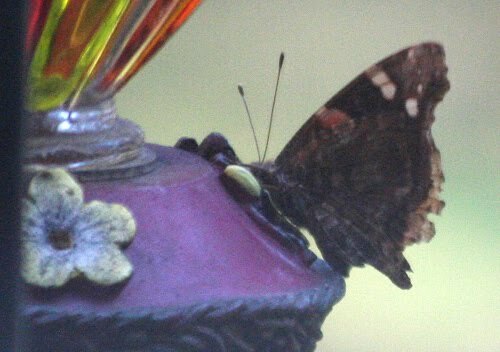 There's not a lot to attract the butterflies in my yard just now but this at least gives them something to sip. Cold one day, hot the next. It must be December in Texas. This has been pretty much a typical December week. It did get down to freezing and left us with some frost one night, but the very next day the temperatures were rising once again. Tomorrow it's supposed to get up to 80, but then on Sunday the forecasters tell us the mercury will plunge. Never a dull moment with Southeast Texas weather! I can't say that I accomplished very much in my yard this week, although I did make a start on the after-frost cleanup. I started by cutting back some of my frost-burnt cannas, but that's about as far as I got. There's still a lot to do, some of which I hope to get done tomorrow. Another of my post-frost tasks was taking care of my green tomatoes. I made the green tomato relish that I told you about earlier in the week. In fact I had two batches of the stuff! I just hope it proves edible. On Wednesday, I had a very exciting outing with my younger daughter. 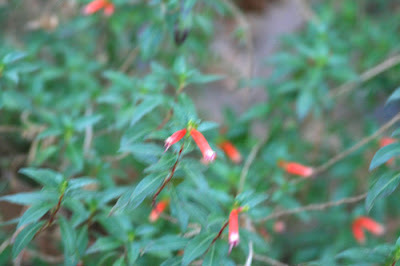 We visited the Heights and toured a couple of the native plant nurseries there, namely Buchanan's and Joshua's. They are both terrificly interesting establishments with very similar stock for sale. Buchanan's is a bit more upscale and has a wonderful gift shop where I could easily have wandered all afternoon. Joshua's is more downhome and their staff deals in the hard sell, which I found a little disconcerting. When I'm considering the plants I want to buy, I don't really want some salesperson shoving another plant at me and telling me what a great bargain it is. But that's just me. Both places were busily preparing for Saturday's "Mistletoe Madness in the Heights" event, and they were doing a brisk business in Christmas trees as Christmas music filled the air. I wasn't there for a tree, though. I was shopping for some of the native plants on my wish list and I was able to make both establishments a bit richer by leaving with a car full of plants. Among the plants I came home with were a strawberry bush, almond verbena, red firespike, a couple of dwarf wax myrtles, and some pavonias. I could have got more but my daughter's car is small. I had been hoping to come home with a sumac, but I didn't find one at either place. Ah, well, I'm sure one will turn up for me one of these days. On Thursday, I spent the afternoon at my daughter's house working in her yard. She works long hours and that doesn't leave her much time or energy for her poor garden. It did need some attention. Her loquat tree had bit the dust. I'm not sure, and neither was she, whether it was a result of last winter's freezes or this summer's drought. More likely, it was a combination of the two. I have an offspring of her tree in my yard and it is very healthy, but I think it probably got quite a bit more tender loving care than hers did. 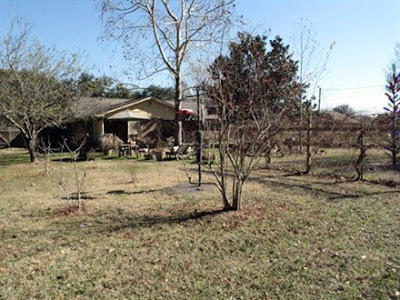 We cleaned up her backyard and removed most of the loquat, except for the base of the trunk which will require a chain saw. The little garden looked much, much better when we finished. But her yard, like mine, is suffering from the drought. A pine tree in her front yard is dead and will have to be removed by professionals. 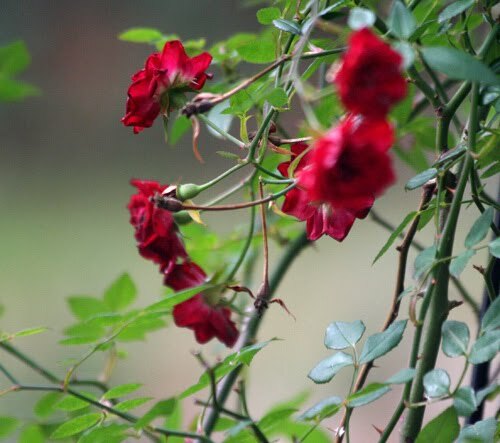 If she doesn't provide sufficient supplemental water, she may lose more plants. As long as the drought continues and the autumn rains stubbornly refuse to make their appearance, we are locked into the necessity of continuing to provide some water for our plants. It's not as urgent as when the temperatures were in the high 90s every day, but plants do appreciate a little drinky even when the thermometer is reading in the 60s and 70s. So, as long as it stays dry, you'll still find me dragging the hoses around every week, trying to keep my plants happy. Thus is the life of a gardener. We had our first light frost of the season last Friday night, or early Saturday morning. It put an end to a lot of the blooms in the garden. Tonight, we are expecting a second, perhaps heavier, frost with temperatures down to the high 20s. 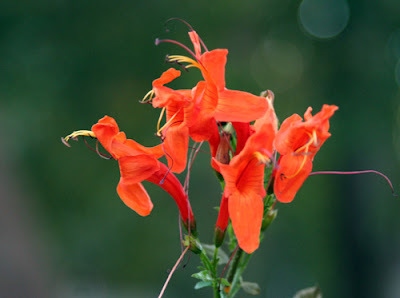 This afternoon, I took the camera out to document what was still blooming as of today, realizing that the roll-call of bloomers might be further reduced by tomorrow morning. 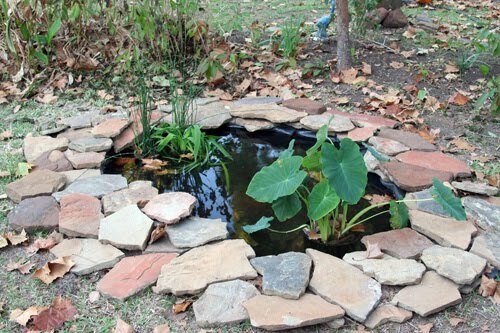 But first, before we "ponder" my bloomers, let me show you my pond! When I last showed it to you, it was just a hole in the ground. It still needs a bit of tweaking and there will eventually be a planting bed partially surrounding it and some sort of waterfall or fountain to move the water, but it is essentially complete. The plants were all in place prior to last week's frost and they survived intact. We'll see whether they survive tonight's lower temperatures. The pond also now has seven fishy residents - six tiny goldfish and one foot-long plecostamus that had outgrown my small 30 gallon aquarium. I think the pleco is much happier now. Nearby, in my iron washpot fountain, the small alocasia did not fare as well as the pond plants in the frost. Its top leaves were nipped back, although the leaves that were closer to the water are still green. Will they still be green tomorrow? 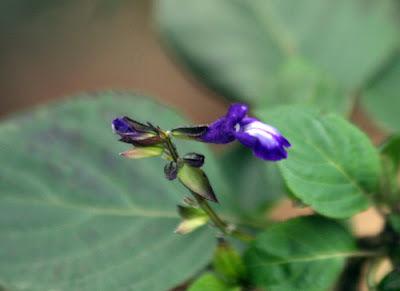 Around the yard, most of the sages shrugged off the frost and are still blooming. We'll let this one autumn sage stand in for all of them. Unsurprisingly, the roses, those tough old gals, are still blooming. 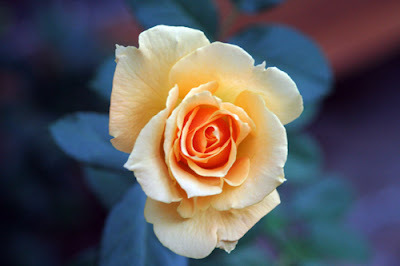 It takes more than one light frost to discourage them. 'Radazz' Knockout leads the way. 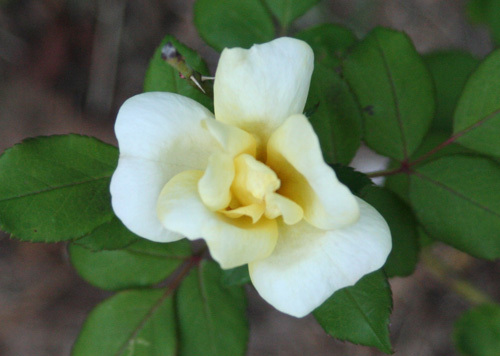 'Radsunny' yellow still has plenty of color left, too. As have the pretty pink Knockouts. 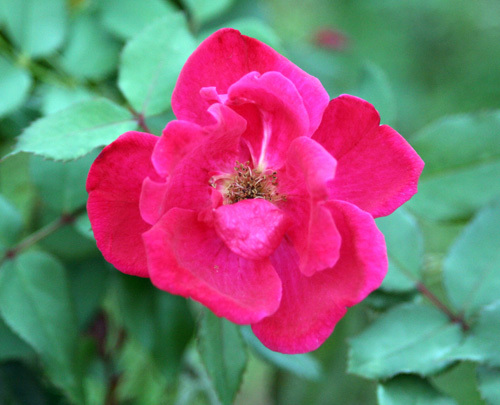 Not to be outdone by the upstart Knockouts, the old roses, like this 'Red Cascade', continue to show their colors. For the 'Ducher' rose, white qualifies as a color. 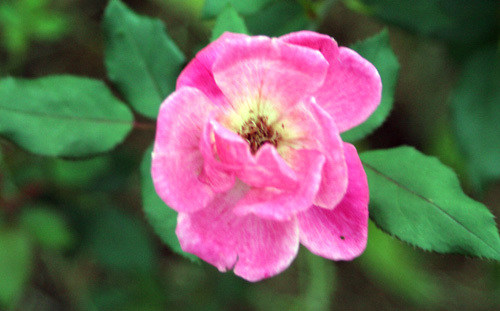 My sentimental favorite, the 'Caldwell Pink', is still in full bloom. 'Monkey Business' is a new floribunda, introduced this year, but it has held its own with the Knockouts and the antique roses in my garden. It is a definite keeper. The bleeding heart clerodendrum had its upper parts nipped by last week's frost, but the lower parts of the vine are still in bloom. 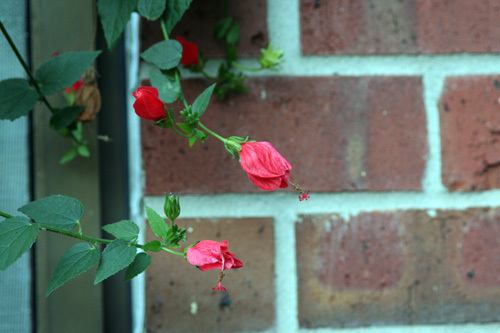 Likewise, 'Big Momma' Turk's cap was bitten by the frost, but the parts that were closer to the brick wall were protected and still continue in bloom. 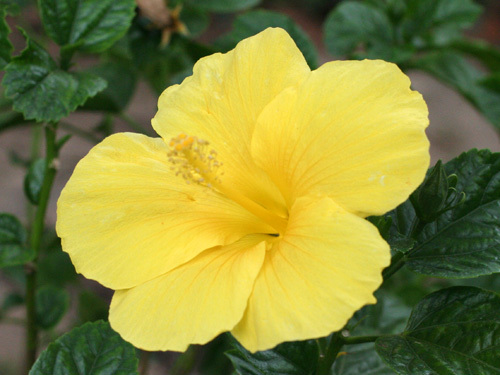 My hibiscus plants that were in the ground were burned by the frost, but the three that were in pots are still blooming this week. 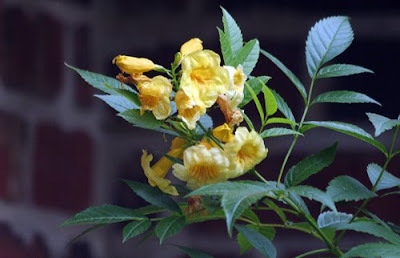 The 'Sunset Yellow' is the only one of the three that had open blossoms today. 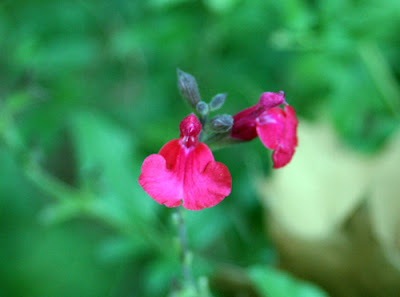 The cigar plant cuphea is still in full bloom, although most of the customers for its nectar have now moved on. 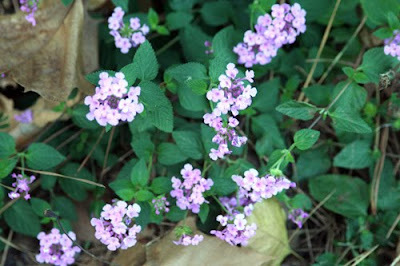 All of the lantanas were blackened by frost except for this purple trailer which seems totally unfazed by it. Surprizingly, the summer phlox still had a few blossoms to offer as well. 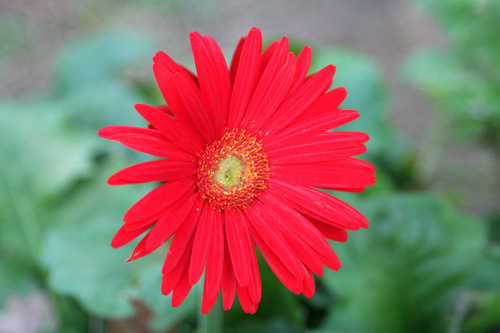 The gerberas survived the first frost. We'll see whether they make it through a second. 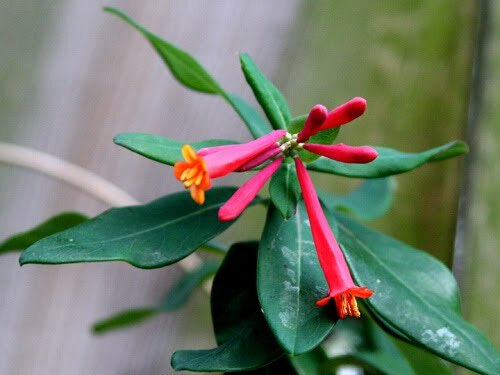 A few of the blooms of the Cape honeysuckle, which had just reached full bloom, escaped the frost. Will they still burn as brightly tomorrow? The garden in settling down, withdrawing into itself and getting ready for winter. There's a lot of cleanup waiting to be done. It'll wait a few more days until the full extent of the frost damage can be seen. Then, finally, I can put much of the garden to bed and let it sleep out the next three months. It has earned its rest.